From kindergarten to high school, Horwitz pursued art in spite of scholastic art programs and majors constantly being defunded or canceled outright. Through crayons, markers, and watercolors he developed nascent artistic talents, drawing inspiration from a pet boa constrictor, dinosaurs, dragons, and outer space. All themes that would continue to weave a consistent thread throughout his work to this day. At the age of 15, Horwitz awoke in a room not unlike his apartment bedroom in Brooklyn. However, instead of his familiar bedroom walls, he saw there the early morning sky. Brightly upon it, in a place of great prominence, was Venus. As he looked at Venus, there too emerged Jesus Christ upon the cross. Then, looking upon the face of Jesus, Horwitz felt his heart to be melted. Having grown up in a secular household, Horwitz took in this most signifcant and unprompted experience and, as Jesus instructed, allowed the morning star to rise in his heart. Not long thereafter, Horwitz was brought to a Grateful Dead concert and subsequently dosed with LSD. There, he recountsthe experience as 50,000 people transforming into the ﬂames of candles. They appeared to him as sitting Buddhas, moving in time with the music. As a young adult, Horwitz found himself unable to remain at the same college long enough to study art formally (attending Antioch University, and the college founded by Manley P. Hall to name but a few). Although his life had become a series of pilgrimages, his practice of art would cease entirely in the midst of these journeys. Traveling from West to East, he lived in India, spending time in Ashrams, and making connections with Hare Krishnas, Yogis, and others who would become life-long inﬂuences and mentors. Though, for Horwitz, East to West, the love of Jesus was frst and he continued to look into Him and His word. The importance of these journey’s became apparent in the way that as an adventure ended, art would invariably return. Indeed, his art is a re-telling of these very pilgrimages. He creates concrete images of an ephemeral world. 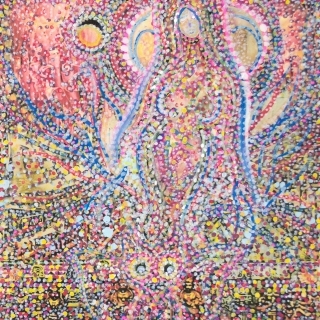 Quantum vibrations of these foundational life experiences reverberate through the serpents, astral beings, and everyday fgures depicted in the otherworldly radiance of his paintings. Tea bags flled with watercolor and bleeding ink give rise to the surreal motions of exploding psychedelic color to be found in his work. More obvious fgures and piercing eyes take shape through the stark pointillism that is a hallmark of his paintings. The doom of Armageddon is ever present in Horwitz’s mind, and so too, is there something darker being communicated. Subtle warnings of disaster are at times juxtaposed with painted expressions of bliss all while the grandeur of Vermont’s natural world permeates his art. Jason Horwitz currently resides at the Quarry Hill Community, in Rochester, VT, a place with which he’s had a life-long connection. With a direct spiritual knowledge of Jesus, Horwitz continues to make art and contemplate such varied topics as QAnon, a Flat Earth, the Mandela effect, Adrenochrome, and the approaching Rapture.